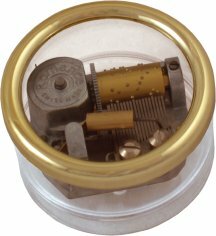 This musical paperweight is fitted with a clockwork wound 'Romance' 18 note movement made by Reuge in Switzerland and has a removeable ring that enables you to place your own photo or picture on the top. A great gift idea for all those who love music boxes! For more information on the musical movements used, please click here. Clear perspex paperweight. Removeable top ring for picture insert.